While Rolex watches are—in our opinion—pretty perfect when they come out of the factory in Switzerland, some wearers like to add their own touch to them. There are different ways to customize a Rolex watch from adding gems to PVD coating to engraving and more. Whether you’re into customizing or not, have a look at some of these crazy custom Rolex watches. John Mayer’s love of watches is well documented. He has quite the collection of both modern and vintage watches from some of the leading brands in the industry. He also seems to be big into Mickey Mouse as shown by his custom Louis Vuitton luggage emblazoned with the famous Disney character, as well as sporting Mickey Mouse shirts. Sunday Fun… Black Mickey Daytona. So why not merge the famous mouse with a famous chronograph? Back in 2013, John Mayer posted some renderings of a custom Daytona ref. 116520 with black PVD coating with a large Mickey Mouse on the dial on his Tumblr page. A few months later, a live shot of the custom Rolex Daytona on his wrist showed up on his Instagram profile. Nicely done. Les Artisans De Genève is a company that specializes in custom Rolex watches modifying modern Rolex watches to look more like famous vintage models. The company also has also been a part of a few celebrity collaborations with icons like Lenny Kravitz and Spike Lee. Spike Lee’s custom Rolex watch is named Cool Hand Brooklyn. This is in honor of both his hometown and the most famous celebrity Daytona owner that ever lived, Paul Newman. (Paul Newman starred in a movie called Cool Hand Luke). Starting with the steel Dayton ref. 116520, the Spike Lee-designed custom Daytona not only flaunts a bright blue and orange colorway reminiscent of the uniforms of his beloved team, the New York Knicks but also has a sapphire casebak for a view of the famed Cal. 4130 movement within. Lil Yachty is a young rapper with a career that’s only a few years long. But his net worth is already in the millions thanks to lucrative endorsements along with his popular songs. And how does this 21-year-old like to spend his wealth? A lot of it goes to lavish jewelry and watches—so much so, that GQ recently asked Lil Yachty to show off his collection. One thing you’ll notice with Lil Yachty’s watches is that most of them are completely covered in diamonds from top to bottom. And since most of these Rolex watches do not come out of the factory that way, we know that they’ve been custom set with gems. For instance, Rolex does not make a full diamond Sky-Dweller or a full diamond two-tone Datejust. But thanks to after-market customization, Lil Yachty is the proud owner of an iced-out Sky-Dweller with a blue dial. Also a full diamond two-tone steel and Everose Datejust 41. This also includes plenty of other full diamond Rolex Day-Date President watches. Blaine Halvorson is the creative force behind MadeWorn, a brand that celebrates handmade craftsmanship, nostalgia, and rock n’ roll. Along with all the beautifully made products MadeWorn sells, the brand can also custom engrave Rolex watches. Carving our way through time. But we’re not talking simple engravings here. 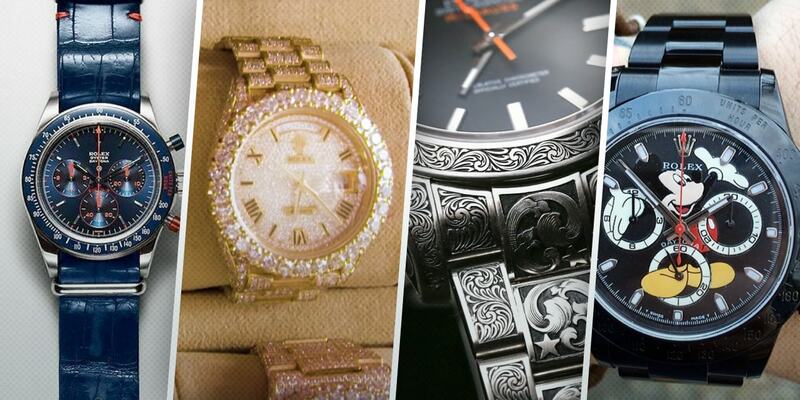 But rather intricately hand-carved metal surfaces that can include the case, bezel, and bracelet. Since skilled artisans do this by hand, no two MadeWorn-engraved Rolex watches are the same resulting in a truly unique piece. A touch of Americana on legendary Swiss watches. Custom Rolex watches are not to everyone’s taste—but that’s the point. They are a way to express personal style via a well-recognized brand. Whether using gems, colors, drawings or engravings, there are plenty of ways to customize a Rolex watch ranging from the subtle to the outlandish.